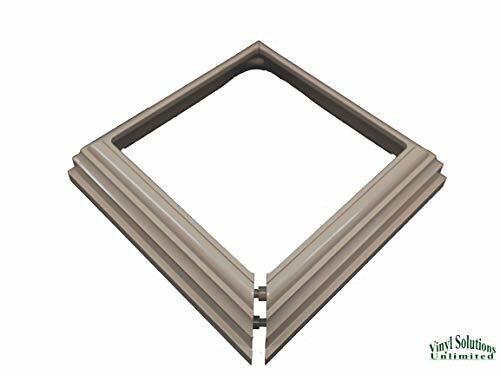 Finish off any rail installation with a decorative post cap. 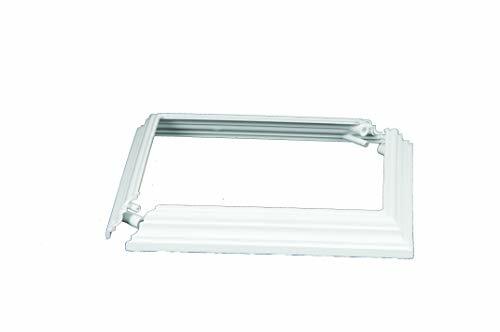 Post caps are lightweight and easy to install. Atlanta Post Caps is our family owned & operated business, and we distribute millions of post caps worldwide from our headquarters in Decatur, Georgia. 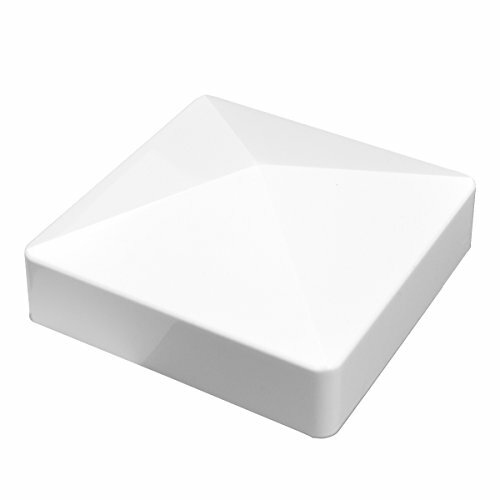 We're the only patented post cap on the market and are proudly manufactured in the United States! 1 - SLIDE: Slide the post cap base onto your post. 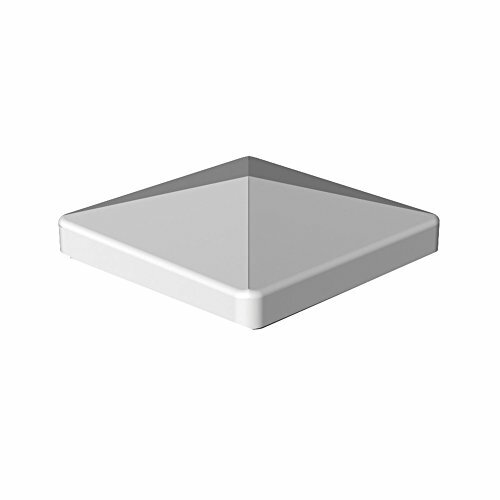 The bottom of your post cap base is smaller than the top of the post cap, and the two cap supports should be on top side of the base. 2 - SCREW: Secure the base to the post using the 2 pre-drilled holes on each of the cap supports. We highly suggest using anti-rust screws to ensure a lasting, no-hassle attachment. 3 - PLACE: Align the top of the post cap over the secured base. This will cover the screws, so you do't be able to see them once the cap is fully installed. 4 - SNAP: Simply press and the cap will "snap" firmly into place. Your post cap is now fully installed! 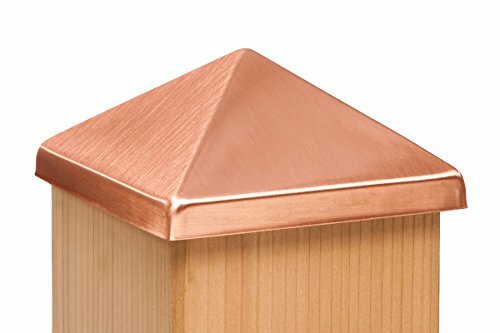 WHAT ARE THE DIMENSIONS OF MY POST CAP? 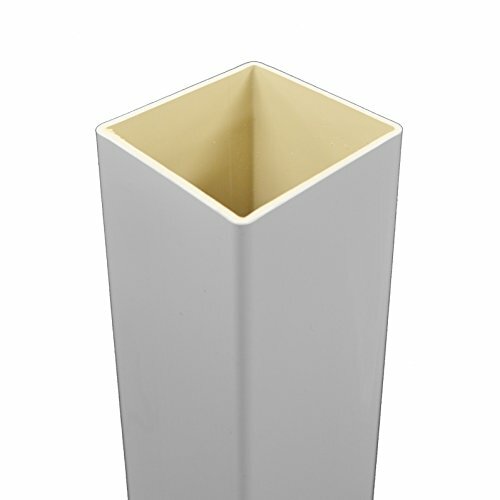 This 4x4 nominal size post cap will fits a standard (nominal) post (3.5" x 3.5" up to 3.75' x 3.75'). These caps slide down the post 1.5" and are 5.5" x 5.5" at their widest point. WHAT ARE ATLANTA POST CAPS MADE OF? 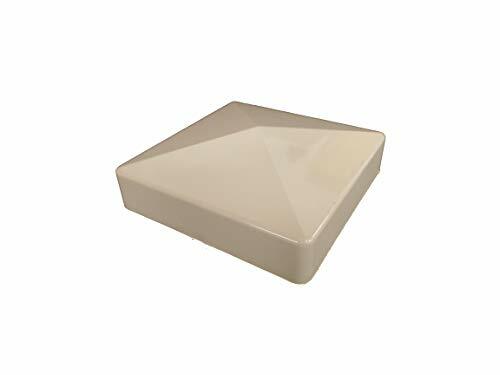 Our post caps are made from a UV-resistant, high-impact ASA resin, a material commonly used on automobiles and marine vehicles. Tough, durable ASA is what makes our post caps longer lasting than traditional wood post caps and allows them to keep their shape and color in even the harshest weather. Some styles are also available in metal! WHAT IS THE DIFFERENCE BETWEEN NOMINAL AND ACTUAL SIZING? If you purchased lumber from the hardware store marked "4 in. x 4 in. (nominal)," it likely measures closer to 3.5 inches x 3.5 inches. because nominal sizing is smaller than actual sizing. Actual sizing is the exact measurement of the dimensions of the wood, so a piece of lumber marked "4 in. x 4 in. (actual)" will genuinely measure 4 in x 4 in. This ground spike will simplify the installation of any post without the use of concrete. Driven into the ground and firmly bolted on your post, it can accommodate many types of posts such as mailboxes, fence, signage etc. Please take time to measure your post not all 4x4 post are the same dimension. 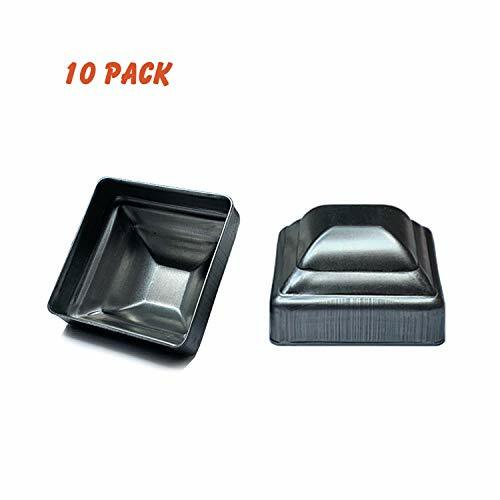 This set of 8 (eight) high-grade Prescott Plastics brand black soft PVC rubber like caps are made in the USA. Our caps are designed to hold up against impact abuse, and harsh weather conditions to provide years of protection. 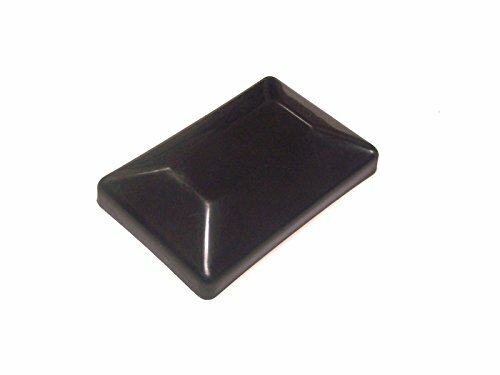 Our flexable end caps work great for preventing scuffs on kitchen or wood floor, as pliable protective seal for metal chair tips, patio furniture, bench feet, table legs, bar stools, or to cover any square pole or hole. These easy to install push-on caps serve as a long-lasting solution for many household, outdoor, & marine boat dock projects including replacements for fencing railing posts, steel gate rail stopper, flexible rod / rebar or wrought iron tube caps, thread bolt screw or nut safety, hub cap sheath, or finishing any sqaure tubing. 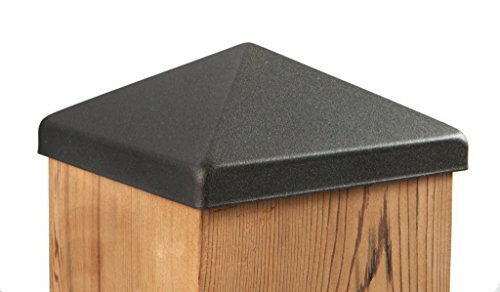 With it's solid powder coated aluminum construction, this 6x6 post cap is sure to enhance and protect any outdoor deck or fence post for years to come. 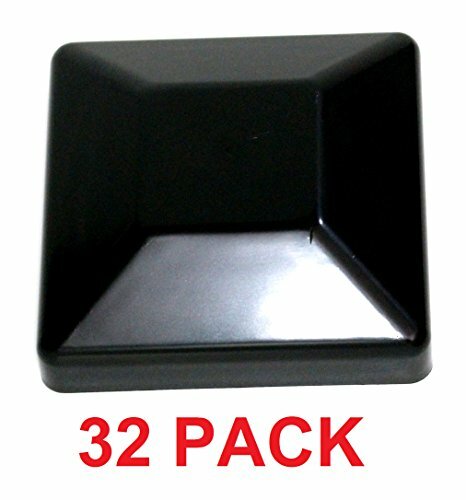 Designed to fit over a standard 6x6 fence post cap that measures 5 1/2" x 5 1/2". Easily installs by applying any outdoor adhesive to the inner flange of the cap. approx. 1.5" high. Inside cap measures 3.625" x 3.625". Top of pyramid cap will extend approx. 3/4" above top of post when installed. Simple 2 screw installation! These post cap multi-packs are currently on sale. Put them in your cart and order today! Available in 4-Packs and single packs also as well as Gloss White! 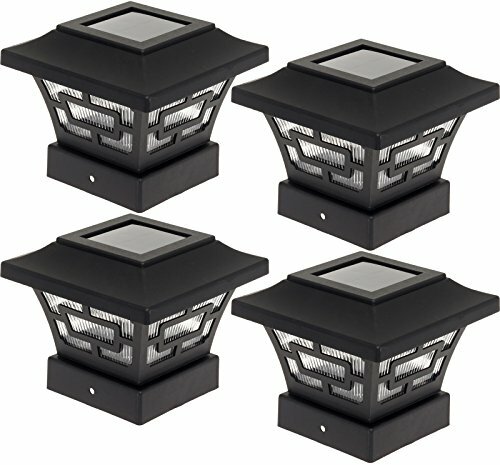 [MULTI-PACK] 10 (Ten) Gloss Black Powder Coated Post Caps with screws made of sturdy cast aluminum. [FIT] Fits 3.5 x 3.5 (4 nominal) standard wood post. 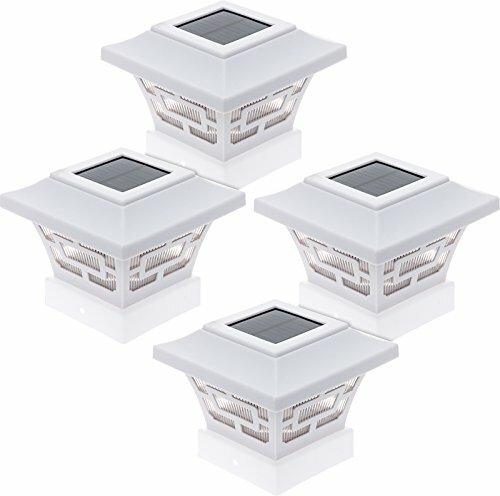 Pyramid design also fits standard 4x4 mailbox, deck, lamp post, dock and piling posts. This Woodway Acorn Finial Cedar Wood Post Cap Style 870.1869 is an elegant and practical solution to protect your posts from the natural elements. 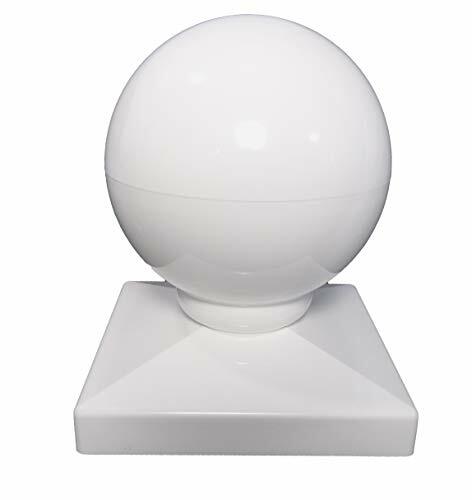 Use this decorative wood finial to top any fencing, deck railing, lamp or mailbox post. It adds beauty while it protects the top of your post from water and sun damage. 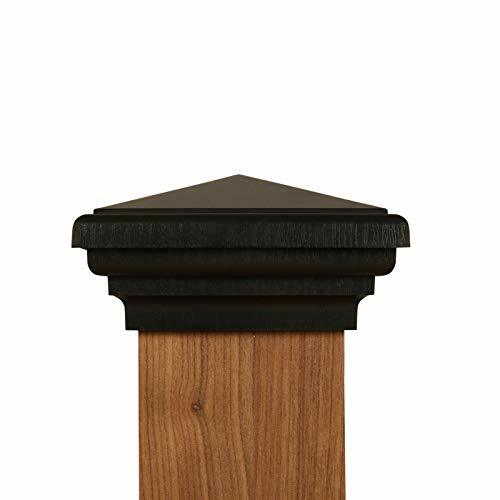 Made out of premium Western Red Cedar wood, this post finial is naturally rot and pest resistant. Measuring 3 1/16th inches wide by 5 1/8 inches high it can be used both indoors and outdoors. Final acorn post cap is pre-fitted with a inch wide galvanized lag screw that measures 2.5 inches in length for easy application. This decorative acorn post cap will twist into place, stays secure, and can be stacked onto other post caps. MADE OF CEDAR- Acorn finial made out of the highest quality Western Red Cedar wood which is naturally weather and rot resistant. Measures 3 1/16th inches wide by 5 1/8th inches high. PREFITTED LAG SCREW - Post finial is pre-fitted with a inch wide galvanized lag screw that measures 2.5 inches in length for easy application. Post cap will twist into place and stays secure. DECORATIVE POST FINIAL - Finial can be used alone or mounted on top of another post cap for a unique look. 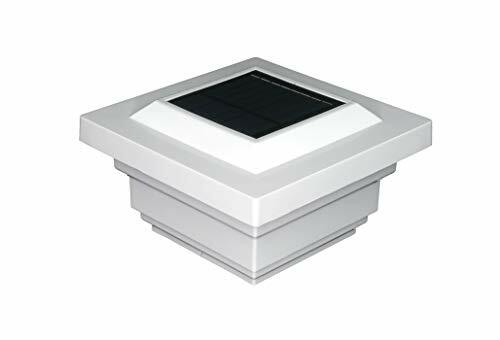 Post cap can also be used for indoor applications. Use as is or can be stained any color. POST CAP PREVENTS DAMAGE - Extend the life of your fence posts by providing protection from water damage and sun. 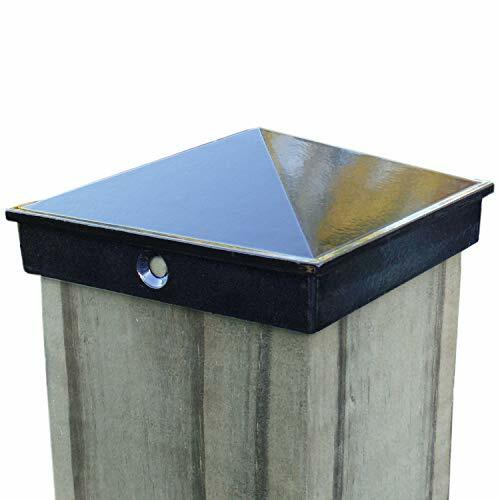 This post cap is made for durability and helps prevent water from seeping into post. 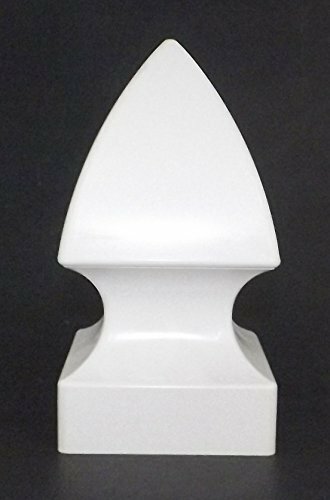 CLASSIC DESIGN - With its classic architectural design, this decorative finial adds a touch of class and elegance to your deck, patio fence, or post. Base measures 3 and 1/16 wide. Top of pyramid cap will extend approx. 3/4" above top of post when installed. Simple 2 screw installation! These post cap single-packs are currently on sale. Put them in your cart and order today! Also available in 4-Packs and 10-Packs. 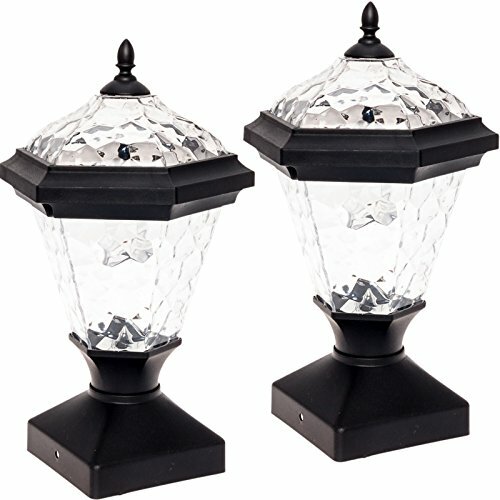 [SINGLE-PACK] 1 (One) Gloss Black Powder Coated Post Cap with screws made of sturdy cast aluminum. 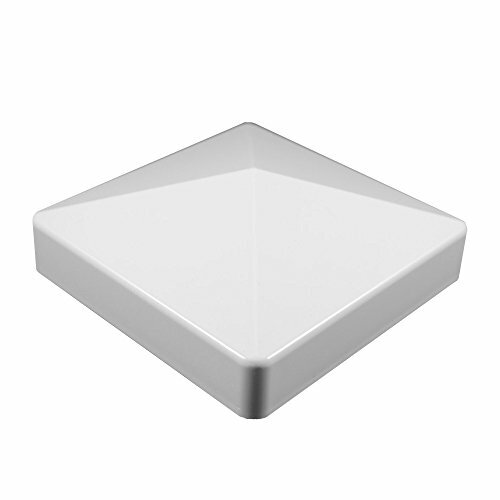 The 5 inch by 5 inch New England white vinyl post cap adds a decorative and finished look to your deck, fence or mailbox post. Manufactured from high quality vinyl, the New England post cap will not fade, discolor or warp over time. The New England cap is both UV and water resistant and carries a limited lifetime warranty. 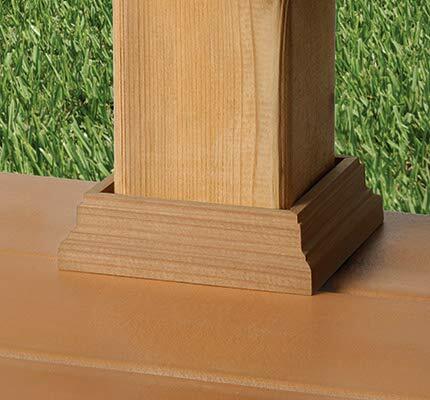 The New England post cap measures 2.25 inches high and fits externally on a true 5 inch by 5 inch post. The post will go into the New England cap 1.6 inches. The New England cap fits a 5 inch by 5 inch post but extends 1 inch outside the profile of the post. If you have gates, assure the extension of the cap will not interfere with gate functionality. The New England cap may be secured to the post using clear silicone made for outdoor use (not included). Do not use vinyl glue or super glue, as you will not be able to remove the cap if necessary. Cap sold individually. Please message us if you have any questions. The New England cap fits externally on a true 5 in. x 5 in. 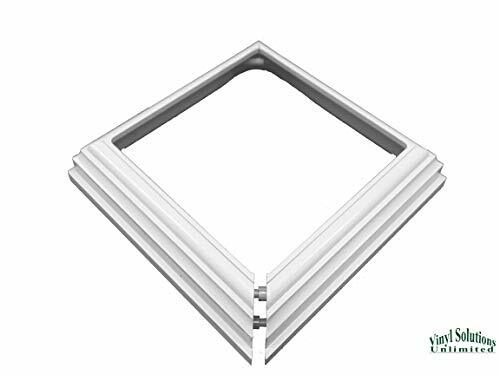 post | Simple to install | Made in the U.S.A.
White Gothic Vinyl Post Cap for 4" Square Post to Enhance and Distinguish your Vinyl Fence and Yard! Gothic Style Post Cap for 4" square post. 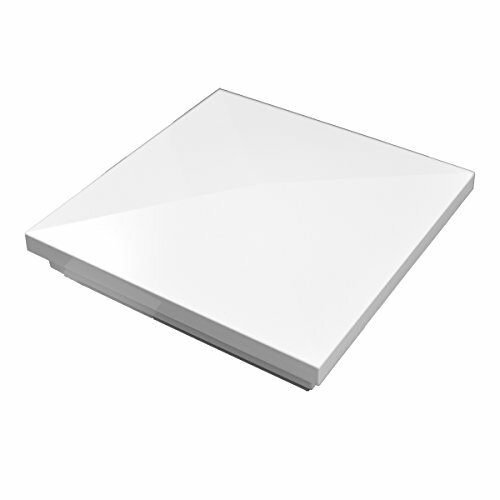 This 5" x 5" Vinyl Post cap is very dependable with proven performance. Comes in three different colors (white, tan, and adobe). Adobe is darker than tan. 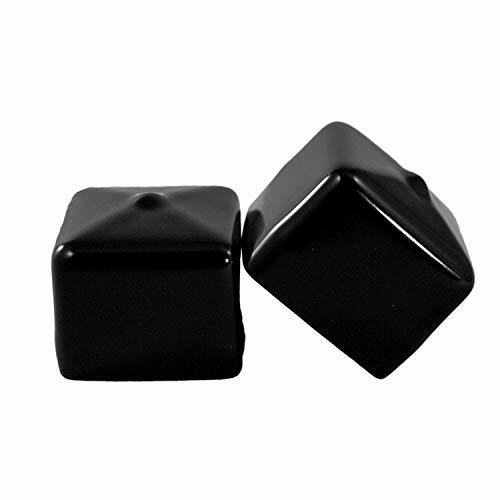 These caps work great for replacement caps or new construction. WHICH SIZE OF STEEL CAPS I WILL NEED? The plugs that we offer are labeled for use with the named steel post external size, therefore, simply measure the external size of your steel post. 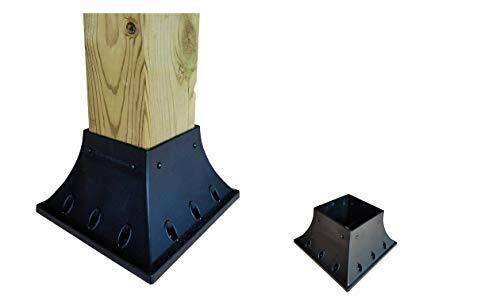 For example: if the outside diameter of your steel post is 2" x 2", please choose our 2 inch square steel cap to slip over your post. For use with 2 inch (O.D.) square steel fence or railing posts. Give your project the protection that will last the life of your post. Slip over the top of the steel tubing for easy installation. No welding necessary. No need of any screws or adhesive. These post caps that we offer are labeled for use with the named steel post external size, therefore, simply measure the external size of your steel post. 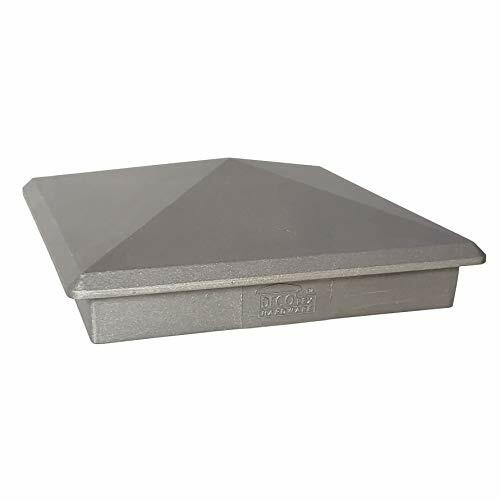 For example: if the outside diameter of your steel post is 2 x 2, please choose our 2 inch square steel cap.